Please join us on Thursday, Nov. 29th for this double presentation. 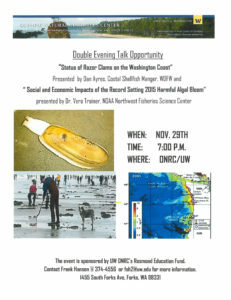 We are fortunate to have Mr. Daniel Ayers, WDFW; and Dr. Vera Trainer, NOAA’s Northwest Fisheries Science Center for a double Evening Talk on Thursday, Nov. 29th. The event will begin promptly at 7:00 pm. and run longer into the evening than the usual single presentation. Dan Ayers’ presentation will be on the “Status of Razor Clams on the Washington Coast”. Dan is the Coastal Shellfish Manager for Washington Department of Fish and Wildlife. He is the WDFW Biologist who leads the coastal shellfish unit based in Montesano and Willapa Bay. He manages Washington’s very popular razor clam fishery and oversees the unit’s work managing the coastal Dungeness crab, pink shrimp and spot prawn fisheries, and the Willapa Bay oyster reserves and research projects in Willapa Bay. Dan also works closely with other state and federal agencies on harmful algal bloom issues since toxin domoic acid was first found along the Washington coasts in 1991. Dr. Trainer will speak after Dan Ayers’s presentation on Dr. Stephanie Moore’s work on “Social and Economic Impacts of the Record-Setting 2015 Harmful Algal Bloom”. Dr. Vera Trainer is the Supervisory Oceanographer for the Marine Biotoxin program at the Northwest Fisheries Science Center in Seattle WA. Current research activities include refinement of analytical methods for both marine toxin and toxigenic species detection, assessment of environmental conditions that influence toxic bloom development and understanding shellfish susceptibility to toxins in their environment. She is president of the International Society for the Study of Harmful Algae (ISSHA) and is the Science Board chair-elect of the North Pacific Marine Science Organization (PICES). She is also the lead investigator of the Puget Sound Monitoring Program for harmful algal blooms (Sound Toxins) and was one of the founders of the Olympic Region Harmful Algal Bloom (ORHAB) partnership. Vera received her Ph.D. in Biochemistry and Molecular Biology at the University of Miami, with postgraduate studies in the Pharmacology Department at the University of Washington. Both individuals are here in Forks at the ONRC for an ORHAB (Olympic Region Harmful Algal Bloom) meeting coordinated by Rich Osborne, Aquatic Program Manager at ONRC and are making their time available for some community outreach and engagement in their important work. Please join us! Evening Talks at ONRC is funded through the Rosmond Forestry Education Fund, an endowment that honors the contributions of Fred Rosmond and his family to forestry, natural resources, and the Forks community. Refreshments will be served and a potluck of your favorite dessert is encouraged. For more information contact: Frank Hanson at 374-4556 or fsh2@uw.edu.